Recently, the company Play’n GO has released another unusual slot dedicated to a long history and rich culture of South American Indians. The model called Contact surprises with non-standard design, original gameplay and other unusual features. All this has become possible since the company Play’n GO is an experienced developer of gambling software who knows what exactly the gamblers need. It is also important that it is very easy to play this slot. All you must do is set the stakes and click Start. Contact is a cascade slot, which uses a unique structure of draws and a lot of interesting surprises of the functional plan. The set of characteristics of this slot is headed by bonuses, which are launched under certain conditions and open huge prospects for large payouts of prizes, especially when it comes to super free spins. 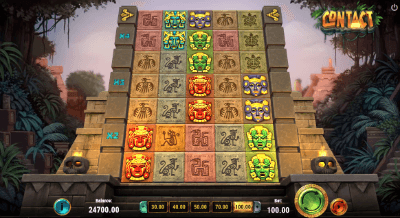 The name of the slot Contact reflects the authors' idea on the subject of the plot, where users should establish contact with ancient civilizations using a virtual pyramid. Its walls are decorated with various shapes and signs that played the role of symbols with individual payments after the formation of clusters of 5+ identical pictures. The strategy of rates for the slot Contact must consider an incredibly high level of volatility. In addition, it is important to be patient so that the slot can justify the predicted theoretical return rates in the long run. The drum kill function works in the Contact slot the opposite of how you are used to seeing it. Instead of explosions of victorious combinations, all symbols are removed from the field that do not participate there. Collapsing Reels actions continue until the relevant images drop out or the bonus is launched. Multipliers accompany slot participants throughout the betting distance, but with different coefficients. In the basic mode, they have the values x2, x3 or x4, and after starting the free spins can reach x30. In any case, to apply the multiplier, it is necessary to assemble a horizontal cluster in the row where they are located. The special functionality of the Contact slot consists of three different add-ons that are used in the free spins process to destroy Multiplier blocks, increase the rank of characters, or activate additional Free spins. 6 Super spins for the whole field of clusters may start after the “Free spins” draws. If we talk about the advantages of this slot, then it should be noted that the playing field has a non-existent structure, because, as has already been said, there are no rotating drums in their usual form, which we used to see and consider them to be classics. Also, the advantages of this slot include a very advantageous system of draws for the player, participating in which you will not leave the online casino with empty pockets. This also means high potential payouts in the bonus mode, which will please any player. As a conclusion to this review, we would like to give advice to all lovers of excitement who want to play this slot, and it concerns both beginners and experienced players. So, if you have just started to join the field of gambling entertainment, use the demo mode of this slot. Some players consider it useless, as it does not bring real payments. However, no one says that you need to use the demo mode instead of the usual game. When you have experience and knowledge, go to a serious game with money bets. The slot Contact from Play'n GO will meet all your hopes and literally fill you with chic winnings. It is considered one of the most generous slots in online casinos (after all, its RTP is 96.55%), and therefore it's time to grab the tail of Mrs. Fortune.